DesignEvo is the best logo maker design application that lets you easily design your impressive logos. You do not need any professional design skills. In just a few minutes you will be able to create your own logo that looks like a pro one made by a professional logo designer. Interestingly, this site does not charge you any fees. So you can create as many logos as you want. Choose one I like to move this forward, I noticed with a pop-up a dialog box asking to enter company name and company slogan. You can choose to skip this section without including the box space provided by clicking the Skip button or just clicking the top right button of “Start from Scratch”. After that, you’ll get an interface that lets you start your logo design process. Here if you want to change the logo you have chosen, you can activate the design and press the delete button on the keyboard or you can choose the desired betting from Shape and Icon on the DesignEvo interface. In terms of its icon, DesignEvo allows you to search millions of icons online for free. Type the keywords and press enter key then you can see the target icons displayed on the left list. Next, we need to change the text style, font, color and the icons color, etc. To personalize your logo. To change font type, you may just select the text box and choose the font, color or style you like. There are various types and interesting font designs in Classic and Art section that you can choose here. It’s flexible to change the text size and it opacity and so on. Just do the same to change the icon as well. DesignEvo provides many Shape resources in the app. It’s not a must. If you want to make your logo more customize, use the shape to decorate your design. Here are 7 different categories of Shape objects including Badge, Decoration, Line, Solid Shape, Outlined Shape, Banner, Symbol. You are able to flip the shape and change it’s color and opacity as well. Here I’d love to add no shape to my logo. Then, if you are satisfied and want to preview the design results of the logo, just click on the Preview icon next to the Download icon at the top right. 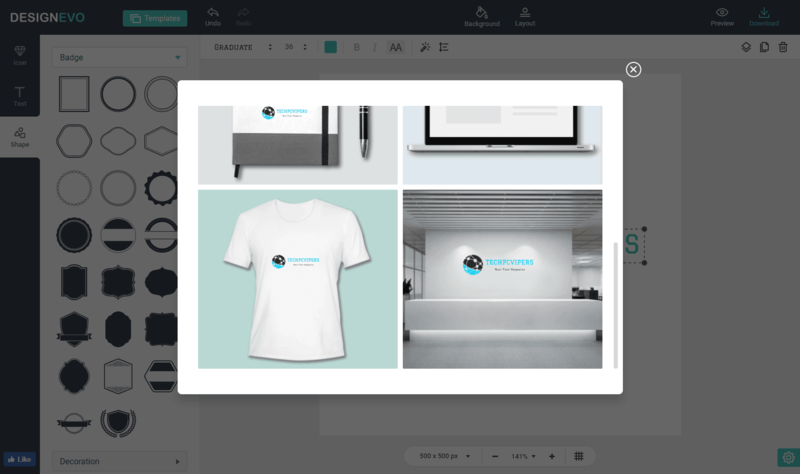 The preview provides an overview of logo layouts in some places such as shirts, business cards, websites and corporate headlines. Once you finished all the logo designs, you can just download your logo by clicking on the Download icon. Before you can download the logo, you are asked by DesignEvo to give you credit through your social media, blog or website you have. After that, you can click the “Download and Agree” button to download the logo you designed earlier. Browse through our different categories or search 3000+ logo templates using keywords to find the logo that meets your needs and customize it to make it your own. 100+ stylish fonts including the classical ones and many art fonts. All of our logos can be fully customized to get a unique look. Tap your creativity and inner designer – the possibilities are limitless! 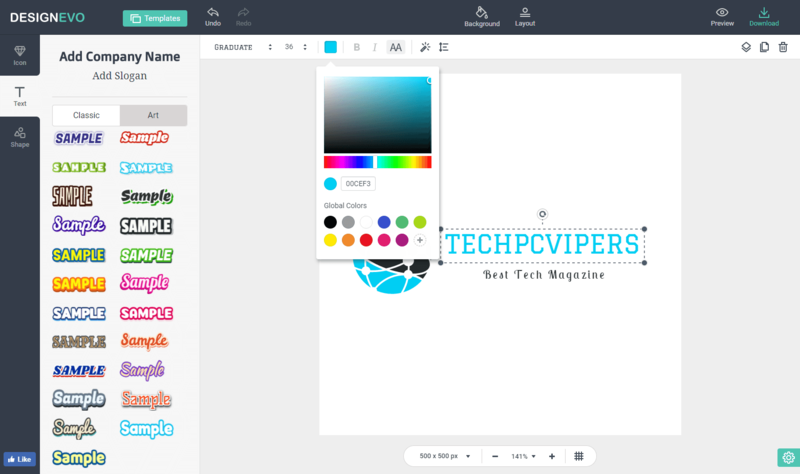 DesignEvo is free and simple to use. No download or registration is required. It saves time, energy and money. If you have any little changes you wish to return, click on the Undo or Redo button located on the DesignEvo interface. DesignEvo has a clear interface even if you are first to its site, you can fully control it. Here is also a simple guideline in the app when you start your logo design. When you download the logo, DesignEvo provides three files in a Zip file: one JPG and two PNG(one is with the transparent background, the other is not) for almost every basic usage. After trying a few days with various circumstances, I find DesignEvo is the best logo maker design application site, easy to use by anyone. The interface with a simple toolkit option makes it easy to understand. Every new one comes to its site would quickly know how to use it. Since the professionally designed templates help you in getting ideas when the logo design process is running, you do not even need to have great logo design skills because DesignEvo will make you a great logo designer. Additionally, there is no limit to the number of designs you can create and can be used for free, making DesignEvo a more attractive online website. If you like this DesignEvo, you can also download its RM39.90 app through the Mac App Store. Currently, DesignEvo Logo Maker application only works on Mac (OS X 9.0 and above) only.